New York (TADIAS) – Emahoy Tsege Mariam Gebru performed at a sold out benefit concert for the first time in 35 years at the Jewish Community Center in Washington, DC last month. 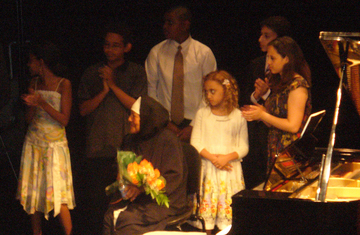 The 85-year-old nun and renowned classical pianist and composer captured an eager audience, along with seven young performers who shared the stage with her. The first set at the July 12th event included “The Song of the Sea” in E-Flat Major and “Mother Love” in G major and the previously unpublished “The Phantoms” — a set of works evoking early and vivid childhood memories from her early life, growing up in Addis Ababa, Ethiopia and traveling in Switzerland at the age of six. She played with an unabashed love for melody and thoughtfulness, finishing the set carefully with Beethoven’s “Fur Elise,” one of her favorites. The next generation of talented, young performers, ranging in age from eight to 16, played various instruments like the piano, violin, flute and saxophone. Each performer brought the impulses of Girma Yifrashewa, Vivaldi, Schubert and Coltrane. The last set of the program concluded with two unpublished works from Emahoy. Her extraordinary performance was viscerally and emotionally moving. Her astounding ability as a classical pianist and her skill to warmly express “Reverie,” was a pleasure to listen to, as was “Presentiment,” a sweet, poetic Sonata in B-Flat Major. She finished the set with a moving “Quo Vadis,” a spiritual reflection that asks where everyone is going. After a laudatory announcement from the audience, Emahoy returned to the stage to perform “Homeless Wanderer,” a beautifully-phrased piece, with an improvisatory quality that only she can express. The final and her most well known work received a splendid, big over- the-top-rendition from Adam Zerihoun, a 16-year-old from New Jersey with stunning fingerwork. The nostalgic mood of the program signified a torch-passing moment from one generation to another. There was the exceptionally gifted Anasimos Mandefro, a 12-year-old, saxophonist who performed “Mr. PC” and “Equinox” by John Coltrane and 16-year-old pianist, Ariel Rose Walzer, who elegantly performed Impromptu No. Allegro in E-Flat by Schubert. Given the right type of support, Emahoy’s compositions have a chance of transcending a new form of classical Ethiopian music. The concert’s proceeds went to The Emahoy Tsege Mariam Music (ETM) Foundation, a non-profit organization whose mission is to teach classical and jazz music to children in Africa and assist American children to study music in Africa. Emahoy’s music can be heard on the Ethiopiques Series, Vol 21. Makeda Amha is a great niece of Emahoy Tsege Mariam Gebru. I hope she will perform here in Ethiopia as well. God bless her, it’s shows us that there are many talented ethiopian women, she is a role model for every one in ethiopia and abroad. it is so funny , to see a monk like this. wow! I heard about her but I didn’t know she was real. Seriously she’s an inspiration to all female, young, ethiopian musicians and I’m sure others as well. Hope she lives long enough to make sheet music based on her works for the ALto SaX and Flute and Viola and Piano …..
First of all i want to say for emahoy tsege maraim god bless you for and ever amen. you are anamazing ethiopian treasure ,you inspired alot of young ethiopian people mentally &spritualy ,god bless you emaohy but i have one comment when i’m searching to listen your clssic music from you tube vedio i couldn’t found it please release one of your favaorite song . Please tell me this is recorded and released somewhere on the internet. This magnificent lady should be interviewed on camera to pass her words for future generation. I’m glad, blessed and honored to discover you now, “better late than never” I wish you long healthy life and thank you for you inspiring spirit and for making me love and appreciate piano even more Kibirt Emahoy!! And thank you Tadias magazine, you do a great job, God bless!! I grew up listening to the ‘homeless wanderer’ as a soundtrack for many stories back in Ethiopia, the most notable was ‘Yewodianesh‘, a story of forbidden love between a son of an aristocrat and a maid (Yewodianesh). I always wondered about Emahoy’s identity all my life. What strikes me is how little is known about this amazing woman (in this bizarre time when people do all kind of stuff to be famous). Thank you Tadias Megazine. Better late than never, as one of the commentors stated. Emahoy, I wish you many many more years! hello evrey one ok, artist or emahoy tsege mariam gebru is one of the best we have. do not be surprised of emahoy tsige, we ethiopian are the home of saint yared, the ethiopian style of spritual kebero, masenko and begena bits. what is the big deal. i can sense the way some of you try to dig somthing that i do not like, for example one of you suggusted that people try to do any thing to be famous, i understand your situation as a person , but do not generalize or use commom sense when you contribute your ideas towards people, because it does not motivate us. thanks yartistlig love emohoy tsege mariam gebru. is it true the reason she became a nun is of a broken heart ?? i love the calmness of her piece.she’s truely spritual.